AILÍN: is the DUP finished? 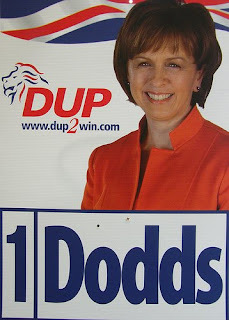 Has the performance of TUV in the European Elections signalled the end of the DUP? Early reports suggest that the TUV bigots have performed well in many areas which the DUP had previously regarded as "their" terrority. This does not auger well for the future of power sharing, with TUV policy firmly and determinedly against participating in the stormont assembly. This is a tragedy and with bigots like the TUV becoming more popular at the elections we have some dark days ahead.